8:07 – What a block by Teague! He made a bad gamble trying to steal the pass to Garnett but runs across the court to block Dooling’s three. 8:08 – I’m downgrading THE GREAT MAMBINO’s Ugly NBA Power Rankings post from an “A+” to merely an “A” for omitting Ivan Johnson’s jump shot. 8:08 – Well played first quarter, exciting game. The pace is a lot faster than I expected. Score tied at 24. 8:11 – Oh wait, they are still on the Celts-Hawks game – the players out there right now are just that bad. 8:13 – Bradley aggressive drive to draw the foul. Love the aggressiveness! Pierce can’t do it all by himself, so Bradley needs to stay aggressive and keep Pierce from wearing out. 8:13 – Greg Anthony says Atlanta is settling for jump shots too much. Right on point. 8:17 – Your AOL Instant Messenger Play of the Week! (i.e. a play that would have been way cooler ten years ago) – McGrady’s block on Garnett. I want to say great block by McGrady, but neither player got off the floor by more than 12 inches. 28-26 Boston. 8:26 – Bradley comes down and nails the jumper with more than 19 seconds on the shot clock. LOVE THE AGGRESIVENESS! 8:29 – Smith shoots the 3-pointer off the side of the backboard. Did Lebron and Wade just lay out a blueprint for him this season? 8:30 – Back to back transition baskets including a slam by Josh Smith. Boston has to limit the turnovers and long rebounds. 8:36 – Great drive including a pivot and spin by Pierce. I’m calm again. 38-36 Boston. 8:39 – Monster slam by Teague as Bass is slow to cover him off of the pick. Lots of easy buckets for Atlanta right now as they are playing with a lot of energy. The half ends, with the Hawks up 44-41 on the C’s. 9:01 – Pierce back to back turnovers, followed by a bad pass that Teague almost picks off. 9:02 – Pierce is bent over waiting for the free throw shots. He’s played an awful lot of minutes tonight and is dying right now, even though the second half just stared. 9:12 – Keyon Dooling with the three-pointer. That’s the first for the Celics this SERIES in 20 attempts, yet they have been competitive. Does anybody wonder why I’m not worried about the Hawks? 9:13 – Smith finds Ivan Johnson for a dunk, his sixth assist of the night. Maybe he is learning from Lebron. God I hope they put the ball in his hands during the fourth quarter. 9:13 – Pierce with a terrible shot. 9:13 – Is Brandon Bass even playing? Most extras in movies have bigger roles than he’s had in this game. He’s a complete non-factor when Rondo’s not in there. 9:16 – Pierce goes to the line after a bad foul call on Smith. Maybe this will get him going. Score is 58-51, Atlanta. 9:17 – Teague with the great tear drop and then drives to the hoop and draws the foul on the next possesion. I was watching a Kentucky game earlier this year and they said his brother was even more talented than Jeff was. If that’s true, then Khloe has the potential to be the best looking Kardashian. 9:18 – Joe Johnson nails the 3-pointer after the deflected pass goes right to his hands. This is starting to get out of hand…65-54, Atlanta. 9:24 – 6-0 run for Boston which is the result of great defense the last three possessions, making the score 65-60. 9:27 – Pierce is playing very intelligently right now. He’s obviously tired, but he’s doing a great job getting to the line for some free points. 9:28 – Teague is thinking he’s playing a game of “21”. He just tried to take three Celtics defenders on at one time. 9:29 – Boston down by five. I say to myself in my best Russian voice (which for some odd reason is the same as my Indian voice) “Hanging around, hanging around. Kid’s got alligator blood. Can’t get rid of him.” Contrary to popular belief, I’m completely sober right now. End of the third quarter. 9:31 – Garnett misses another shot. What is up with him? He’s sucked tonight. 9:34 – Pierce with the layup. We’re getting closer. C’s within 3, 66-63. 9:35 – Shot clock violation by Atlanta. Boston has really clamped down on defense since the end of the third quarter. 9:37 – Timeout Atlanta. They have one point in the last five and half minutes. 9:41 – YOU’RE MY BOY BRADLEY. Take that jumper! Good to see the aggressiveness after he disappeared for awhile. Tie game, 66 all. 9:44 – Smith upset about bad foul call. BUMP THE REF! 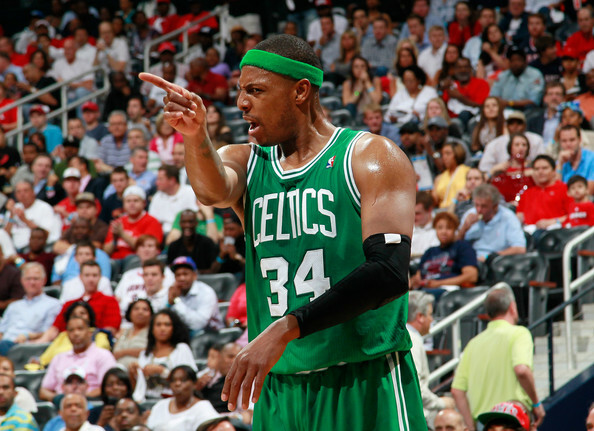 9:46 – Pierce gives the Celts their first lead since early first quarter with 5 minutes left; 72-70 Boston. 9:47 – Garnett finds cutting Daniels for the two-handed throwdown. 9:51 – Bradley another great block on Teague who has abused everybody else on the court, but has not yet learned that he can’t beat Bradley. Someone told me that Native Americans used to teach their kids that fire was hot by letting them burn themselves. I’m guessing if Teague had Native American parents, he’d look like Two-Face. 9:52 – Smith headed to locker room – not sure what happened. On cue, steal by Pierce off deflection followed by a pass to Bradley who passes it back to him for the slam. The Celts are just playing some incredible defense right now. 76-72, Boston. 9:52 – Pierce hits a big three after a defensive stop. He starts fist beating his chest, deservedly so. You earned it tonight carrying the offense and playing all those minutes. 9:56 – Smith sprained his left knee. Uh-oh. 9:57 – Ivan Johnson turns the ball over driving to the hoop. They are down by 7 with 3:30 left and the Hawks are relying on Ivan Johnson to make plays? I couldn’t be any more excited as a Celtics fan. 79-72, Boston. 9:57 – Ivan Johnson nails the long jumper and the free throw after getting Pierce in the air with a pump fake. MMMMMMMMMMMMMM…crow tastes good. 9:58 – Pierce nails the jumper – he has 34 points now. He’s getting better and better during these closing minutes. 79-72, Boston. 10:01 – Stat box comes up – Pierce has 11 in the fourth. You watching Lebron? 10:04 – Johnson with the stupid three point attempt. Dumb decision. 10:05 – Pierce fouled after another rebound. Nails both FTs followed by a Tebow. I can’t figure out why non-Boston fans hate this guy…81-75, Boston. 10:07 – Ivan Johnson blocked by Garnett. I feel vindicated. 10:08 – Joe Johnson misses another shot. That’s right. 10:12 – Pierce with another Tebow. You’d love him if he were on your team, I swear. Great win by the Celtics. It wouldn’t have been impossible, but going home down two games would have made this a far more difficult series to win. You can’t say enough about the game Pierce had. He wasn’t perfect: he was sloppy with the ball at times (8 TOs), particularly at the beginning of the second half, but he stepped up big-time for an undermanned Celtics squad and had a huge game (36 points, 14 rebounds and 4 assists) including some great defense. It’s odd to say, but I think he’s actually underrated. He’s a big-game player who doesn’t always get the recognition he deserves because he’s not flashy or super athletic. He relies on intelligence, subtle moves, great footwork and very good but not out-of-this world shooting. The Hawks have to be worried right now. Boston’s defense has been superb since midway through Q2 of game 1 and, with a healthy Rondo, the Celts’ offense is only going to get better. Add in the fact that Boston now has home court advantage and it doesn’t look very promising for the Hawks. One Response to "Running Diary – Celtics/Hawks Playoffs Game 2"
Well, in all fairness, both Brett and Jacoby are contributing equally as much right now to their respective teams. That is – nothing.